We (my wife and I that is) keep the temperature in our home relatively low in winter. As I’m writing this, it’s a balmy 16 degrees C in my living room. My lovely wife is wearing a toque and she’s about to put on another sweater because she’s feeling “a bit of a chill”, but she’s a trooper and wouldn’t have it any other way. That’s how she was raised. In Richmond, BC, where we live, winters are… well… wet. It’s pretty much a case of 100% relative humidity outside 24/7 and the water table is at ground level… well… truthfully sometimes it’s a few feet above ground level, but that’s why we have the pumps. Combine 100% relative humidity outside with low temperatures inside and as you might expect, we occasionally have issues with condensation, especially on windows. “Experts” generally don’t recommend keeping interior temperatures below about 17 degrees C for exactly this reason. I don’t care much for expert opinions (experience has convinced me that I’m more expert than most of them), but I also don’t care much for condensation. The solution (without simply raising the temperature of our home), is a dehumidifier. While I purchased it for its intended purpose (to reduce humidity levels) I now realize that it also makes a very effective heater. Ah… but doesn’t it cost money and energy to operate a dehumidifier? Well… actually… NO! At least not in the winter, when we’re heating our home with electricity anyway. In fact, a dehumidifier is MORE efficient than an ordinary electric heater, which is already 100% efficient. Yes, a dehumidifier is more than 100% efficient at heating your home. That is to say the amount of heat a dehumidifier will release into your home is greater than the amount of electrical energy it will consume. The reason is simple: a dehumidifier removes energy from water vapor in the air in order to condense it to a liquid. This energy is released into your home. There is a property of any substance known as the enthalpy of vaporization. “Enthalpy” really just means energy. The enthalpy of vaporization of a substance is a measure of how much energy it takes to convert a given mass of the substance from a liquid to a gas. It also indicates how much energy is released when a given mass of the substance is condensed from a gas to a liquid. The enthalpy of vaporization of water is 2257 kJ/kg. How efficient is a dehumidifier at heating your home? Let’s figure it out together. I mean that literally. As I write this, I haven’t actually figured it out yet myself. I’m flying by the seat of my pants here, people; I’m a scientist gone rogue. But luckily I’m also a scientist who recently acquired a portable dehumidifier. I plugged it into a Kill-A-Watt meter several hours ago to measure exactly how much electrical energy (indicated in kWh by the Kill-A-Watt meter) it consumed. It’s been running for about 8 hours and it has consumed 3.87 kWh of electricity. Thus, based on the first law of thermodynamcis I know it has put at least 3.87 kWh of heat into my home. However I have also determined with a simple digital scale that it has condensed 3.23 kg of water in that same time. How much additional energy did it release into my home as a result of that? That’s where the enthalpy of vaporization comes in. 3.23 kg multiplied by the enthalpy of vaporization of water (2257 kJ/kg) gives 7290 kJ of energy. A kWh is equivalent to 3600 kJ so 7290 kJ is equivalent to 2.025 kWh. Thus, the total amount of heat released into my home by the dehumidifier over the last 8 hours is equivalent to the 3.87 kWh of electricity consumed, plus the 2.025 kWh of energy released by the condensation of water. The “efficiency” is equal to the energy output divided by the energy input or in this case (3.87 + 2.025)/3.87 = 1.52 or 152% efficiency. An efficiency over 100% is more appropriately referred to as a “coefficient of performance” since technically, it is impossible to achieve greater than 100% efficiency (having more than 100% efficiency in energy conversion would defy the first law of thermodynamics). So if you ever measure more than 100% efficiency, as I just did, what it really means is that you have moved energy from one place to another rather than simply converted energy from one form to another. Such is the case with a dehumidifier which removes energy from water vapor and releases it into the home in the form of heat, condensing the water to liquid in the process. But whatever the terminology you want to use, the fact remains that I can release 1.52 kWh of heat into my home for every 1 kWh of electricity my dehumidifier consumes. I paid about $250 CAD for my dehumidifier. It consumes about 480W of electricity (3.87 kWh in 8 h) and outputs about 730W of heat (480W*1.52) into my home. I can buy a decent electric heater that will output 730W for about $50. So the difference in price is about $200. Let’s calculate the difference in the cost to operate. A 730W electric heater consumes exactly 730W of electricity. The dehumidifier only consumes 480W of electricity to produce the same 730W of heat. The difference (730-480) is 250W. Effectively I get a free kWh (1000 Wh)of heat for every 4 hours of operation. I currently pay about $0.07 per kWh for electricty, so I save about $0.42 per day when operating the dehumidifier in place of a heater. My heating season runs from October through March, or around 180 days of the year. Therefore, I can save about 180*$0.42 = $75 per year by operating the dehumidifier in place of a heater. That will take a little over 2.5 years to pay back the difference in price of $200. In a word, “No”. The human body is most comfortable at a relative humidity between 20% and 60%. I can run my dehumidifier continuously in winter and not expect to ever drop below 20% relative humidity inside my home. The same may not be true for homeowners in other locations maintaining their homes at higher temperatures than I do. Heating with a dehumidifier works for me because of the high relative humidity in Richmond, even in the winter, and because of the low temperature at which I keep the interior of my home. It could work well for anyone who lives in a similar environment and keeps their home at a low temperature. But if you live where temperatures are usually below 0 degrees C outside in winter then you likely have a much lower relatively humidity. In that case, a dehumidifier will not be able to condense nearly as much water for a given amount of input energy and its operation may bring the relative humidity below a comfortable level. If you’re considering hanging your wet clothing to dry inside your home, vs using your drier, then you should know that a dehumidifier will be far more efficient than a clothes dryer. In the case of a clothes dryer, electrical energy is used to vaporize the water in your clothing and the water vapor (and all the energy you’ve put into it) is expelled from your home through your drier vent. There is a net loss of energy from your home. If instead you use a dehumidifier, the heat already in your home is used to vaporize (evaporate) the water in your clothing. This energy is recaptured by the dehumidifier when the water vapor is condensed to liquid. Unlike the drier, the dehumidifier doesn’t expel any energy from your home. A dehumidifier is effectively a heat pump. Rather than extracting heat from the ground or the outside air, a dehumidifier extracts heat from water vapor contained in a home’s inside air. In my home, for reasons given above, I can run my dehumidifier continuously without reducing the relative humidity in my home below a comfortable level and I’ve found the coefficient of performance (COP) is about 1.52. A typical air source heat pump has a COP of around 4 assuming an outside temperature of around 0 degrees C (a typical Richmond winter). A typical ground source heat pump has a COP of around 7 assuming a ground temperature of around 10 degrees C (a typical Richmond ground temperature). So clearly, a heat pump (either air or ground source) is much more efficient. If I had a heat pump, I would be consuming more energy than otherwise by operating my dehumidifier. That said, I feel secure in the knowledge that I can run my single dehumidifier continuously and consume less energy to heat my home than if I were running an electric heater. I’ll save the installation of a heat pump for another day… perhaps. Can you heat your whole home this way? No. If I were to install more portable dehumidifiers to provide all the heat my home requires (to maintain a balmy 16 degrees C all winter long) I would almost certainly bring the relative humidity below comfortable levels, and the COP would drop below the measured value of 1.52 simply because there isn’t enough water vapor in the air to be condensed. So the idea of using a dehumidifier to heat one’s home is clearly not scalable. At best a dehumidifier may provide suplemental heat. I think I might get away with using two portable dehumidifiers continuously which would each save me about $75 per year based on the calculations above. That’s about $150 per year in total. Currently, that’s about 10% of my home’s annual heating bill. Thanks for the math and your insight on humidifiers as heaters. if so what do you estimate the heating savings to be? Thankyou for the post… As you might have seen from my comment(s) on your oil filled heater project, I heat my house with electric power. There is one area that just gets what it can from whatever is running and that is downstairs. Last year I just dropped a space heater (small hot air burning element with fan in it) in the middle and ran it often at the full 1500w. We kept it at about 17C, I haven’t set it up yet this year and so it is only 15.6C down here right now 😉 anyway, there is more water in the air down here too (shower, laundry etc.) and so this may be a great place to try it. 700 and some odd watts may not be enough for 400 sq ft…. but then again running all the time it might. I think a reversed air conditioner may work. I’ve been considering experimenting with that as well. My primary concern would be that air conditioners are designed for a different temperature range. They are designed for pumping heat out of air at around 20-25 degrees C and into air at around 30 degrees C and up. I don’t know how well they will function pumping heat out of air at around 0 degrees C or lower. I imagine there would be frost buildup on the outside. Above 0 degrees C you could simply turn the unit off periodically and allow the frost to melt, but below 0 degrees C you may need to bring the air conditioner entirely inside frequently to defrost it. I believe air-source heat pumps designed for home heating have built in defrost cycles (which incidentally is one reason that they are less efficient than ground-source heat pumps that don’t require defrosting periodically). Portable air conditioners are unlikely to incorporate a defrost cycle since they are designed for use at temperatures well above freezing. This is all just hypothesis on my part though. I think it would be a worthwhile experiment. It sounds like you may have perfect conditions for using a dehumidifier as an effective heater. If you try it, I’d love to hear how it works out for you. May I just pick your brains a moment. We have a dampness problem in our guest room which is in the cellar. Water vapour generated by the ensuite shower room is condensing in the unheated guest room and condensing on the floor and seeping into the laminate flooring. So we need to get rid of this water vapoour. I want to do it the most energy efficient way. I know dehumidifiers are great (I’m a chemist and love to rave about the benefits to the world of hydrogen bonding without which the humble water molecule could not generate so much energy just by condensing … oh heck while I’m at it did you know that rain in the UK generates the equivalent energy output per year as 1.3 million power stations which is one way we avoid your Richmond winter climates). Anyway back to the question. Is is better to run a dehumidifier or a extractor fan or just leave the window open to remove the excess water vapour. Dehumidifier runs a higher wattage solves the dampness but warms a room we don’t always need warming. A humidity sensitive extractor fan runs lower wattage but presumably takes longer to remove dampness. Leaving the window will only work if the water remains vapour and so presumably requires the room to be heated – and it relies on the outside humidity to be less than the inside. Hi Adrian, your guess is as good as mine. All methods you described may work, but which method will result in the least energy consumption is difficult to say since there is no way to know how long each method would need to be active in order to be effective. I think trial and error is the only way you will know for sure. 1. If the shower stall backs to an exterior wall – put in window on the wall towards the top of the ceiling to be left open while showering. 2. put in a fan in the ceiling that you can run while showering. 3. Get 2 boxes of deliquiescent (sp?) and put one in the room with condensation while the other is losing moisture when you set it outside. I don`t understand one thing about payback time. How did you save $0,42 per day? You said “effectively I get a free kWh (1000 Wh)of heat for every 4 hours of operation”. That means 2kWh for free per 8 hours. And that is 0,07 * 2 = $0,14 per day. Where is my fault? Sorry I did not make that clearer. 8 hours is just how long I ran the dehumidifier for my test. If I ran the dehumidifier continuously (24 hours per day) I would get 6kWh for free per day. And that is $0.07 * 6 = $0.42. The de-humidifier was the final piece to the puzzle. I live in the Fraser Valley in a forty plus year old BC Box. I was trying to use portable electric heaters exclusively. By November 10 my house was damp, smelly and cold; we have old plumbing and our main bathroom does not have a fan so we have accumulated moisture. My son sleeps and spends most of his time downstairs, he was uncomfortable. My husband and son were quickly loosing resolve. I found three very inexpensive 30 litre dehumidifiers. I have used them full power for the last couple weeks; one upstairs and two downstairs. I don’t remember my house ever being this comfortable. Hi…this is my problem…we installed a heat pump with 4 heads..(none in the basement)the good news is our furnace has not been on..the bad news is our basement is freezing..15c ( and warm (very) in the summer) and because we have no heat from the furnace it is humid and warm in the summer …so my thought is that the dehumidifer would most likely be a solution…any thoughts!! I’m not entirely sure what your question is. Yes, a dehumidifier will make your home less humid. It’s particularly good if you live in an area that is more humid in the winter, since the dehumidifier also produces useful heat (making it essentially free to operate). Using it in the summer it will still help your humidity problem, but it will also make your home hotter, and the operating cost will be higher. I don’t want to rain on your parade….but. A dehumidifier does not put heat equal to the kw used. The dehumidifier does useful work from the kw ie: motors for the compressor and fan, they are not 100% efficient, so the only heat from the kw is that amount between useful work and 100%. Typically an electric motor will be some where between 50 and 90% efficient, the compressor like wise isn’t 100% efficient, so the only heat is the delta of efficiency. Heat is only generated in the delta, in other words if you were generating 100% heat from the kw you would have heating elements, if all kw went to heat the motors, fans and compressor would not run. You seem to be suggesting that the energy disappears after being converted to work? That defies the law of conservation of energy (see http://en.wikipedia.org/wiki/Conservation_of_energy). If a motor is 80% efficient then 20% of the input energy will be converted to heat in the motor. The other 80% will do useful work, yes, but unless that useful work results in energy storage (for example, raising a mass, stretching a spring or charging a battery) the energy will eventually be converted to heat. It is a requirement of the law of conservation of energy. For a simple example, consider an electric fan. If the motor is 80% efficient (actually fan motors are typically very inefficient), then 20% of the input electrical energy is converted to heat in the motor. The other 80% does “useful work” meaning it is transmitted through the motor shaft in the form of torque and angular displacement. This useful work will be converted to heat at the interface of the fan blades with the air (similar to how the space shuttle heats up moving through earth’s atmosphere only on a much smaller scale) or in the air itself (due to turbulence induced by the fan) or at another surface that the air hits. When you turn the fan off and the air stops moving, there is no more work. It has all been converted to heat. The operation of the motor, compressor and fan inside a dehumidifier is more complicated but there is no need to consider the details. The law of conservation of energy requires that unless energy is stored, any work done must produce heat exactly equal to the amount of work done. In other words, for most electrical appliances that operate inside your building envelope, the heat input into your home is exactly equal to the electrical energy consumed, regardless of any work done. A 200W fan will put exactly the same amount of heat into your home (200W) as a 200W heater. A dehumidifier is a special case since heat is output both from the electrical consumption and from the condensation of the water. This is a nice piece of measurement and analysis, and I believe your general conclusion. However there are two flaws. 1) Much more water vapour would have condensed onto the interior walls and furnishings, thus generating energy of condensation, if you had not used the dehumifier (that is, after all, why you bought the dehumifier). The heating gain you calculate ignores the fact that this condensation no longer occurs. 2) Sound, light and electro-magnetic radition emitted from the dehumifier can escape the house without being converted to interior heat, so the electrical energy used by the device isn’t all used to heat the house. Even when trapped by the walls, these forms of energy will distribute heat around the perimeter of the space, where they can be lost more quickly. My guess is that 2) leads to a relatively small correction, but 1) probably has a more serious impact. PJ, some dehumidifiers have freeze protection; they either pause or run a heater when their coils get too cold. Dunno about noise, though; that doesn’t seem to be a big priority. Rob, you can add condenser clothes dryers to your list; they’re basically dehumidifiers. Bosch is one vendor. 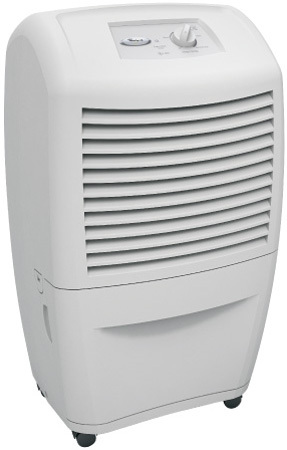 Dehumidifier bonus: dry air feels subjectively warmer (when it’s cold, that is). Most of the condensation you mention in your first point is perimeter condensation anyway. In my experience of cold housing I would expect most condensation to occur on the (relatively) colder windows in comparison to the walls and/or interior furnishings. As the R values of windows are much lower than walls I’d have thought this isn’t the best place for it to be released if making use of the heat is a concern. Wouldn’t having it released within the dehumidifier allow for better use of the heat output compared to just using it to temporarily speed up the molecules in the glass of my super-low-R-value window panes? That’s true, but now we’re talking about the distribution of heat, in which case we need to consider the thermal characteristics of the space being heated. Rob’s original calculation ignored distribution and simply counted all the heat of condensation from the dehumidifer and all the electrical energy as “delivered” heating in some sense. This overstates the coefficient of performance, and in many cases the overstatement would be significant. I read your arguments with interest. Thanks for posting. While I agree with the principles you describe, I think the magnitude of their effect is relatively low (at least in my case). When not using a dehumidifier, we notice condensation only when we add moisture to the interior air by having showers or cooking or hanging wet laundry, etc. This “natural condensation” is a tiny amount compared to that induced by the dehumidifier. Also, natural condensation may result in water condensing on walls, windows and such during periods of high internal humidity but this water will evaporate into the home again over time. Unless there is a net accumulation of liquid water, the net heat released into the home is 0. Natural condensation does not result in a net accumulation of liquid water (not in our home, anyway). The dehumidifier on the other hand results in a net accumulation of nearly 10 litres of liquid water per day which is removed from the home in liquid form resulting in a positive net heat release into the home. There is a third “flaw” in the above calculation. I ignored the heat removed from the liquid water after condensation. When the condensed water drips into the dehumidifier reservoir it is just above 0 degrees C. If removed from the home before it warms up (using the dehumidifier’s drain tube), there is additional heat input into the home. How much? Suppose the condensed water results is 15 degrees C below ambient. The specific heat capacity of water is about 4 kJ/kg/degreeC. Cooling 3.23kg of water by 15 degrees C releases an additional 194 kJ of heat. You can see why I didn’t feel obliged to mention this. Compared to the 7290 kJ of heat released from condensing the water, the additional 194 kJ from further cooling the water releases only about 2-3% more heat into the home. I think the effects you described may be about the same magnitude only in the opposite direction so perhaps they roughly cancel. I do agree with you that my “original calculation ignored distribution”. Heating spaces that don’t need to be heated isn’t efficient (especially perimeter spaces). Unfortunately it’s exactly these cooler spaces where people may be tempted to use a dehumidifier to prevent condensation. I prefer to think of my dehumidifier as an electric heater and locate it accordingly. Mark, is it not possible that the humidity could just stay at (say) 70% if the dehumidifier is not running, without much natural condensation? I would have thought that any water that condenses onto (say) a sofa would just evaporate again – there’d would be some stable “sofa dampness” (at any given air humidity). One problem with using a dehumidifier for heating may be using up the available humidity – or too much of it. A friend in Stockholm says that she really needs a humidifier, as her apartment is uncomfortably dry. Ok, I was confused. It’s not “condensation that would have happened anyway” that’s the problem, it’s the extra evaporation from environmental surfaces that happens when the air humidity drops. So if 2 litres of water end up in the dehumidifier, that may drop the water content of the air by 1 litre and the water content of various surfaces by 1 litre (a net 1 litre condensation) rather than dropping the air water content by 2 litres (for 2 litres of condensation). However I’m not convinced that the furniture and walls will hold that much extra water if the air is at RH 70% than at 60% (which is about what I get from taking 2 litres out of a large room or group of smaller rooms). And if you push the RH much below 60% – and certainly below 50% – it starts getting uncomfortably dry. Like all others that visit, I enjoy your website and ideas. We’re up in North Vancouver. My wife also wears multiple sweaters indoors, but would divorse if she had to resort to touques! We have just finished installing a high efficiency water to air heat pump and HRV system at our coastal cottage (heat pump COP 5ish). We also completed a fairly significant insulation, window, and sealing upgrade. When un-occupied we keep the temp low at 12C and noticed some mold on artwork. I found your website researching dehumidifiers and agree with your COP of 1.5 for dehumidifier heating. But it now leads to the next question. Is it more energy efficient to control moisture and mold with heat pump heat at COP of 5 or with the dehumidier at COP of 1.5? or a combination? I can theorize how to evaluate this, but my background in this area is relatively limited and I’m not sure I’d select appropriate operating conditions to compare. I’ll probably resort to experimentation with a $200 humidifier. Could I trouble you for your thoughts on this? Also we researched the enerstar dehumidifier listing and found the 25liters /day sizes were all in about the 1.6 liters/kWhr energy efficiency. The larger they got the more efficient they got. Are there other types of dehumidifiers that operate at significantly higher efficiencies we should be considering? Hi John. The answer is it depends on the cottage ;-). You need to know how many watts it takes to raise the cottage temperature by one degree C. My home (2500 square feet, reasonably insulated), for example, takes about 200W per degree C. If your cottage is similar then your heat pump would draw 1/5th of that or 40W per degree C. Perhaps you need to get the temperature from 12 degrees C up to around 17 to reduce mold. That would require a 200W draw from the heat pump. I bet you could achieve a similar effect by running a 500W dehumidifier on a timer so that it only runs 1/4 of the time (125W average). So I think it’s likely that the dehumidifier would be cheaper. Again… all guesswork. I’m no expert on dehumidifier brands or efficiencies so I can’t help you there. All I did was test the one I bought. Excellent analysis and responses – there seems to be very little info out there regarding the impact and economy of using dehumidifiers in the home. This sounds great for dehumidifiers that make use of a refrigerant and condenser. What about the other domestic dehumidifiers that use desiccant and rotor technology ? I am thinking of buying one of these , but this blog post has caused me to pause. From what I understand (very limited) the silica gel in these systems absorb the water molecules in the air which is then sweated off with a heat source and eventually collected. Would I be correct in assuming that this type of technology would be inferior to the condenser type with regards to generating “bonus heat” ? or do the desiccant systems generate bonus heat via some other process ? I don’t know much about desiccant based dehumidifiers, but the law of conservation of energy effectively states that the process by which condensation occurs is irrelevant. If you start with water vapor and end with liquid water, then you will have released a certain amount of energy. If there is no form of energy storage in the system, then that energy will be released in the form of heat. Thus all dehumidifiers will release “bonus heat”. However, their coefficient of performance (ie how much heat energy out per unit of electrical energy in) may vary. Without actually testing, I don’t know what type would have a higher COP. Our laundry machines are located in an alcove just off the side of our open kitchen-dining area & our main source of heat for the entire home is electric baseboard. I’ve installed a wood burning stove & do try to have it working through most all of the colder seasons to prevent having to use the electric heat. I’ve even gone as far as disconecting our dryer’s electrical supply because it was constantly being used for undersized loads, while my daughters lived at home & installed a clothes line at the back deck for all laundry drying. Since they’ve moved on, we still now, just use the clothes line to dry laundry but because of our age & the convenience of having a dryer, I’m hooking it back up soon. My thoughts were, to vent the dryer directly into a de-humidifier & release the expelled heat into that arae of the home, while capturing the moisture content, instead of waisting even more energy by venting it directly outside. Is this possible using typical residential use de-humidifiers? 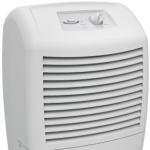 We purchased a small Enerstar dehumidifier about $120 on sale at Canadian Tire. I believe it is only 60W of power demand and operate it full time in the unimproved basement of our cottage. The basement is now remarkably warmer and enjoyably dryer. It removes about 1.5 liters of water a day. Intuitively I believe the warm dry basement is contributing to a warmer dryer home, reduced mold potential and probably increases the heat pump efficiency not having to heat moisture laden air. I haven’t attempted any power comparison with the heat pump, but given the heat pump compressor is 2-3 kW depending on speed, we seem to have achieved significant benefits at a fraction of the heat pump’s power consumption. The dehumidifier is noisy due to high airflow noise but in the basement one barely notices it. We’re planning a similar basement installation in North Vancouver. We also plan to experiment with an indoor clothes drying rack in the same room as dehumidifier. Rusty who commented above about clothes drying might be interested to know that in Europe one can buy clothes dryers that operate strictly on dehumidification and I believe they exhaust into the building area. That would work, but depending how humid your house is to start with, you may find the drier dumps moisture into your home faster than the dehumidifier can remove it, and you may get condensation on windows and walls. Another option is to hang your wet clothing on an indoor rack and run the dehumidifier next to it. That’s what we do. I can’t recall the last time we used our drier. Excellet site and wanderful comments from all. We do need this type of info much more. I have been doing these recommendations since first I bought my old house here in Vancouver 3 years ago. Itâ€™s a 60 year old cottage style one story house and I basically paid for the land. I first double glazed the old wood windows with 1/16â€³ clear plastic glass sheets, resurfaced the floor with used but nice wood floor with good underlay and do use a dehumidifier since beginning. I totally disconnected myself from gas company and pay average 50$ a month for my electricity which is used for everything. I have slowly reduced the temperature inside from 20 to 18 and this year to less than 15 degrees all winter. I use only one small electric heater which is one of those with fake fire display and more importantly it is a mobile one. So we, My wife and I, actually move it when it is needed, though most of the time it is located in the living room. To reduce the consumption we do turn it off during sleep and during day when we are at work. So it is basically used a few hours of evening when we are home. That means inside temperature fluctuates between 16 to 12 during night when temperatur falls. But it really doesntâ€™ bother us and actually feels great to snug in. One trick we use, which we have learned from our cultural background in middle east is to use a large bed spread to put on top of the heater and sit around it by using it to keep our lower body actually it sometimes even hoter than we can handle:) This is a great trick, because the heating area has been step-wised in the sense that where we are sitting it is above 20 degrees, and as you get farther in the living room it gradients out to 15. I like it that you do bring up this very important point in responding to people comments about how much efficiency of various electric appliances is not important, as long as, they are contributing to heating useful space. This is another one of gimmicks of these industries to sell us new appliances in the name of “Star” rated!! In an area like BC we really do not need to go out and replace a perfectly fine apliance in the name energy efficiency. Sure, if you need to buy one, well, better buy an efficient one since it may be put in a “wrong” place. But we should really more emphasize on locating these electric appliances somewhere they can contribute to our heating rather than spend top money for saving a few $ a year on energy on that appliance. When one think of this way, in fact having a regular ( and not a “STAR” rated one) is actually a benefit! why? because they usually are not located all in the same spot in the house and so they contribute to distribution of heat. As a side note, I just received a letter from Fortis BC, the new owner of Terason Gas, that they are basically threatening, politely of couse, to disconnect my gas meter if I donâ€™t activate it again! Of course in the name of safety!! These sleezy business practices really is outrages. What had from very beginning turned me off on gas is the running fees they would charge you for just previlage of having the option of using it! And consider that gas price has been kept depressed in the market as long as I remember, but not for the consumer. So, no, thanks you. I prefer to pay my hard earned money to BC hydro, at least it is not polluting the environment as much. Thanks for this info. I also keep most of my house very cool. But with the dehumidifier running I get about a 3 degree rise in my bedroom. And since I work the night shift the hum of the dehumidifier blocks out other noise. So this was definitely a winning solution for me. you cant gain heat from a closed system and your house is just that. the only heat gain is coming from the transmission line that is outside of the system and it is powering your dehumidifier. the humid air is already inside the house. Hi JohnC. I agree that a house can be treated as a closed system. Standard practice in thermodynamic problem solving is to identify the closed system and identify mass and energy transfer mechanisms into and out of the system. It may be true that the transmission line is the only direct energy transfer into the home (excluding solar radiation), but there is mass transfer into and out of the closed system in the form or air infiltration. If that were not the case you would quickly exhaust all the oxygen in your home and suffocate. The amount of air infiltration is much more significant than you might imagine (typical minimum recommendation is 3 to 4 air changes per hour and houses that are sealed well still need to provide that using ventilation fans). If the temperature of the outgoing air is higher than the temperature of the incoming air, then I’m sure you would agree that represents a form of heat loss from the home. Likewise, if you condense water from the incoming air resulting in drier outgoing air plus outgoing liquid water (poured down the drain), then that represents a form of heat gain within the home. The amount of heat gained is simply the heat of vaporization of the water. Hi Rob, Sounds like a great way to cool a house and keep it dry, but as far as gaining heat from cool moist air that enters the house through cracks and the like, your just bringing in cool moist air then heating it to room temperature removing the moisture and releasing it back out of the building along with the heat gain that was added from the building. Also you will be dumping a percentage of that heat down the drain. 1. Without dehumidifier: cool moist air enters the home and room temperature moist air exits the home. 2. With dehumidifier: cool moist air enters the home and room temperature dry air plus liquid water exits the home. In both scenarios the air and water vapor coming into the home contain the same amount of energy (I think we agree on that). But in Scenario 2, the air and liquid water exiting the home contain less energy than the air and water vapor exiting the home in Scenario 1 (I’m not sure we agree on that… if not, look up “enthalpy of condensation” in wikipedia). Since Scenario 2 has less energy loss from the home, where do you suppose the “saved” energy goes? The first law of thermodynamics says energy must be conserved. The answer is that the energy (the enthalpy of condensation) is released inside the home in the form of heat. I am interested to see whether using a dehumidifier with the window closed is better than just opening the window to air out moisture from clothes drying. I have just done a rough calculation on this and think that dehumidifiers are slightly better that opening the window. Here is my reasoning based on robs great work, data from without hot air, and my own dehumidifier experience . To compare like with like the radiator must match the 2.92kwh of heat generation from the dehumidifier. The thermostat would ensure this. So the dehumidifier is slightly better, but it is very close. Depending on assumptions you make. Please feel free to point out the mistakes I will probably have made. While it may be true that a phase change of water vapor to liquid does indeed release heat, I think you might be missing the human side of the equation. As the human body is constantly sweating and humidifying outward breaths, lower humidity levels will make us feel colder. If the temperature is 21C and you are running a dehumidifier to the low end of the comfort range (20%), the felt temperature will be 18C; whereas, if you run a humidifier to the higher end of the comfort range (60%), the felt temperature will be 21C. With 20% humidity, you would need to raise the thermostat to about 23C in order to achieve a felt temperature of 21C. That’s a 5C difference! I would wager that it is much less expensive to run a humidifier to 60% than it is to raise the thermostat 5C. In short, you would do best to heat your home with a humidifier and cool it with a dehumidifier. Some good points that don’t apply to me but are worth considering for others. Without running a dehumidifier, the relative humidity in my home during the winter (when I maintain 16 degrees C inside temperature) is typically over 80%. Running my dehumidifier continuously I can barely bring it below 60%. The dehumidifier effectively compensates for what would otherwise be unacceptably high humidity (ie leading to condensation) resulting from keeping the interior of my home at a lower than recommended temperature. That’s why I originally bought it. The efficient heating is just a happy byproduct. That’s interesting. I’m in Western Washington and while outdoor relative humidity averages about 80% during the winter, that is at about 6 Celsius. Indoor relative humidity as measured by my hygrometer at 16 C (and as predicted by theory) is about 30%. You are clearly running a very humid house! Lots of cooking or showering? However, the dehumidifier you are running is not heating your house from a human perspective. At 90% humidity at 16C, the apparent temperature is 16C whereas at 20% it would be 13C. But it still does make sense to run a dehumidifier if your indoor RH is above 60% – though I think that is atypical during the winter. I’m curious about the output directly from the dehumidifier, does it feel warmer? It seems that it would be, the same way that a swamp cooler’s output feels cooler in a humidification situation. I do find that higher than 60% does lead to unacceptable condensation. Thanks for your comments. They led me to question my own observations and results. I just did a bit of experimentation and calculation to try to clear things up for myself. It is about 13C outside here now and has been raining all day so I presume it is 100% RH. That would indicate an absolute humidity of about 11 g/m^3 outside based on an online calculator I found here: http://hyperphysics.phy-astr.gsu.edu/hbase/kinetic/relhum.html. Inside it is about 21C (just had a baby 3 days ago… cut me some slack ;-)). My hygrometer currently indicates 69% RH. That would indicate an absolute humidity of about 13 g/m^3 inside. I’m not currently running a dehumidifier. The increased absolute humidity indoors is presumably due to respiration, perspiration, cooking, showers, washing, etc. I don’t think we do much more of any of these than an average household. However, we hang dry our washing indoors rather than use a clothes drier and we avoid using ventilation fans when cooking or in the bathroom (why waste the energy in all that water vapor when you can recapture it with a dehumidifier). Now lets take the case of a typical winter day. Richmond winters see outdoor temperatures averaging around 6C much like Washington but relative humidities averaging around 90% (yes… it’s really wet here). That indicates an absolute humidity of about 6.5 g/m^3. Assuming an additional 2 g/m^3 inside (as I determined above), the absolute humidity inside would be 8.5 g/m^3. At 16C indoor temperature, the relative humidity would be about 63%. This is lower than the 80% I recalled above, but I can’t argue with science ;-). 80% would be correct for outside temperatures around 10C which are common here during the daylight hours (when I would be looking at the hygrometer) of winter. Anyway, now let’s suppose I run my dehumidifier which I determined was condensing about 400g of water per hour. The question is how much should I expect that to change the RH indoors? The volume of my home is about 500 m^3. It is an older home, not particularly well sealed, so I would estimate around 1 air change per hour due to air infiltration (my understanding is that 0.35 air changes per hour is the recommended minimum for good air quality). 400g/h / 500m^3/h = 0.8 g/m^3 of water condensed. Thus I would expect my dehumidifier to reduce the absolute humidity to 8.5-0.8=7.8 g/m^3. The result would be inside relative humidity dropping from 63% to 58%. Again, that is on average. My observation that the humidity rarely falls below 60% is accurate given that I would be observing during the day time when outdoor temperatures are higher. Admittedly there are some big uncertainties on some of the numbers in the above calculations (in particular the number of air changes per hour which is difficult to measure and will vary due to wind), but it seems clear that the observations I described are easily within the realm of possibility. LOL. I just realized an error in my above comments. My hygrometer shows a “comfort zone” between 30% RH and 50% RH. What I should have said above is that even with my dehumidifier running continuously, the RH rarely drops into the “comfort zone” on my hygrometer. I mistakenly assumed this was the same as the 20%-60% range you quoted. In fact the RH rarely drops below 50%, not 60% as I stated. That matches theory a little better. Ah, I see you are measuring humidity during the day when RH is highest whereas I’m looking at a log and looking at the lowest figures which are typically at night and when the skies are fairly clear. I do notice that when we don’t run the ventilation fans during showers and just open up the door, that leads to a massive increase in indoor RH (for a short period). I don’t think I’ve ever seen my hygrometer measure past 75% – even on a muggy summer day with rain after a warm shower – but I might give it a try this December. Drying clothes indoors though would add quite a bit of moisture but I’ve never had much luck with that. The clothes just don’t seem to be as fresh as compared to drying outdoors. That wasn’t with a dehumidifier though. And to be fair, my old outdoors clothesline was in a windy area in a covered carport (no car at the time). It only took about an hour and a half outdoors compared to a day indoors. 63% makes much more sense but if you are reading 80%+ indoors and your instrument is accurate, real world beats scientific theory. I would say that your experience would be atypical and one of the exceptional cases where a dehumidifier does make sense to help heat the house – at least if we have comfort as a factor. Congrats on the baby! If 21C meant a healthier baby, I’d be running that temperature 24/7 lol. @Rusty I’ve had the same thought when looking looking at the warm clouds coming out of the dryer vent in cold weather. My own proposal, which would be practical in new installs only I think, would be to have a heat exchanger that could be decoupled to the vent tubing. It might be somewhat like a radiator which could give the water vapor time to condense and release the heat. Or it might have fins to draw heat from the pipe. Observation may trump theory, but 80% RH was based more on my recollection than any recorded observation. I have not logged the RH over an entire winter. The average inside RH could well have been around 63% as predicted by theory and I could have been simply recalling periods of higher humidity (early/late winter and daytime vs nighttime). We dry our clothes on a clothes line outside in the summer, but it’s just not feasible in the winter given the high humidity, low temperature, rain, and lack of direct sunlight. I agree that clothes feel/smell fresher when dried outside. Things improve a little if after air-drying our clothing inside, I dump them into the drier for a few minutes. It softens them up and seems to make them smell fresher. I guess that you are aware how a dehumidifier works? It’s basically an air conditioner that runs the cold air it produces over its radiator to cool it. So most of the energy from the power plug is mainly used to compress air – which makes it heat up. The compressed air then is cooled and after that allowed to expand – so by then it is colder than the surrounding temperature which is why it releases excess water (condensation). That cold air is run over the radiator that cools the compressed air to enhance the efficiency of the dehumidifier. In the end, the air exits the dehumidifier … definitely dryer and probably a little warmer than before – because it is not 100% efficient. The condensation of the water is bought with a lot of energy – and it has to be more energy than the condensation gives you back. Otherwise you’d have invented a perpetuum mobile and that is – as we all know – impossible. To my knowledge there is no law of thermodynamics that says you can’t get more energy back from condensing water than you “spend” to condense it. This is not perpetual motion. You are not creating energy from nothing but simply moving it from one place to another. Take the example of an ordinary ground source heat pump that will move 4 to 5 units of heat energy from the ground into your home at a cost of only 1 unit of electrical energy. Is that perpetual motion? If so there are thousands of perpetual motion machines installed around the world. A dehumidifier IS a heat pump. Instead of pumping heat out of the ground, it pumps heat out of water vapour, condensing the water in the process. This does require a lot of energy input in the form of electricity, but that energy isn’t lost. You get it back in the form of heat. The heat energy you get out is equal to the electrical energy you put in, plus the energy removed from the water vapour. According to my findings you get about 1.5 units of heat energy out from 1 unit of electrical energy in plus 0.5 units of energy from condensation. It is not perpetual motion but simple energy conversion in which – as we all know – energy cannot be created or destroyed. That is, in a nutshell, the 1st law of thermodynamics which is also known as the law of conservation of energy. Great site! Great comments! I am buying a dehumidifier. I have an HRV but the big problem with that is my neighbor burns wood and the intake for the HRV is often in the windblown path of his smoke. The HRV does have a condensation pump and removes condensation so I assume it would perform similarly to the dehumidifier. Though as it only recovers some of the heat from the air via the exchanger it still loses more than not exchanging any air. I’ll still run it when I see that my neighbor isn’t burning or the wind is going the other way but sounds like I’ll only need to run it to swap out the stale air instead of for humidity/condensation which still occurs on my triple pane metal frame windows. There’s one more energy efficiency benefit that you didn’t consider if you either use a continuous drain or empty the water bucket in a timely fashion: the waste water is cold. This means that the dehumidifier has extracted both the heat of condensation AND some heat due to the temperature change. Of course, if you let the output water warm up to room temperature before disposal, you lose this benefit. I did not mention this phenomenon in the article but I did comment on it. See my comment from 2010-10-31 above for some calculations. I found the energy released from cooling the water is insignificant compared to the energy released from condensing the water. Emptying the water while it is still cold will improve the coefficient of performance by only 2-3%. We have a 900 sq ft house in Chilliwack. Our humidifier saves about 4 months a year of 90’s era furnace use. With asthma or allergies at home. I find the humidifier works best if its wet and >10c outside. 730w. That energy was already there. Unless that energy stored in some form other than heat? Does something happen to the vapor atoms, maybe the some drops to lower electron shells, during condensation? First off, be careful not to confuse units. 730W is a measure of power, not energy. In my article I refer to 730W of heat or 730W of elecricity, but I am referring to heating power or electrical power. To get energy, multiply power by time (as in kWh). There is a property of all substances called the “heat of vaporization” or “enthalpy of vaporization”. Basically, a kg of water vapor at 100 degrees C contains more energy than a kg of liquid water at 100 degrees C. Thus condensing water releases energy. This is also the principle upon which refrigeration works, except the fluid used is not water. My question is: Is it cheaper to heat a home with a dehumidifier and a furnace than just a furnace. With less moisture in the air, less gas will need to be burned by my furnace to heat my home to the same temperature. I’m paying the same gas and electricity prices as you are. Assuming I have 70-80%RH at 19 degrees and a furnace operating at 70% efficiency, and want that to drop to 50% RH. Would the savings in my gas bill be significant enough to offset the higher cost of heating with electricity? Either way, your posts have been very helpful and interesting. There’s condensation on my windows and I’m buying a dehumidifier, the more energy efficient the better to sway your math in my favour. insulate your house. a lot of styrofoam and double-glass-vacuum windows will save you the most. Condensation on windows is a sign of bad insulation. One thing not noted is that electric baseboard heat is usually run at 220v and lower amps than a dehumidifier which is at 110v and twice the amps so you are not really comparing apples to apples. 2nd. you use cost of purchase and not cost of use. If you were to compare the kwh of the 220v baseboard to that of the kwh of the dehumidifier then we would have an interesting comparison of efficiency. A 750 watt heater on 120/v would pull 6.25 amps, while if it was run on 240 it would be 3.125 amps and produce the same heat for less energy consumed ie, price paid. If you compare the cost of energy used between the 220v baseboard and the 110 dehumidifier then we are in the real life apples to apples game. You used “Watts of heat” which does not make sense to me so I am going to go with cost for kwh for thermal efficiency comparisons. In a resistance heater you get 3,413 BTU from one Kilowatt-Hour of electricity. How much heat does a dehumidifier produce? NOTE: Energy efficiency is measured in liters of water removed per kilowatt-hour of energy consumed and the higher the # the better. As expected, the larger the capacity, the larger the coil; larger coils are generally more efficient than smaller coils. See the Energy Star DEH Product List and Criteria. Efficiency aside for a bit, if your dehumidifier consumed 3.87kwh over 8hrs that would = 13,208.3 btu. About ½ of the btu’s of the 240v baseboard heater. I am comparing apples to apples. Based on your comments, I’m not sure you understand the difference between current (Amps) and energy (kWh). Energy (kWh) = voltage (Volts) * current (Amps) * time (hours). I’m afraid that is just wrong. You are correct that the current draw would be less at 240V but that doesn’t mean less energy is consumed. Energy is equal to voltage * current * time. Let’s do the math. How many kWh does a 240V heater that draws 3.125 amps consume in 1 hour. 240V * 3.125A * 1h = 750 watt-hours = 0.75kWh. How many kWh does a 120V heater that draws 6.25 amps consume in 1 hour. 120V * 6.25A * 1h = 750 watt-hours = 0.75kWh. Same energy. Same price. Same fruit (apples). But you don’t need to do the math. “750 Watts” is “0.75 kW” which BY DEFINITION is “0.75 kWh per hour”. Erratum: I should have stated: Damp air conduct heat far more than DRY air because air is a poor heat conductor compare as water that is a great heat conductor. Alain, as moisture increases, thermal conductivity decreases (Energy Conversion and Management 49 (2008) 1098–1110) although from 0 to 50C the heat conductivity differences are negligible. But as we both know, 30C hot and humid feels worse than 30C hot and dry. The explanation can’t lie in the fact that moist air is a worse thermal conductor but rather I believe lies in the greater difficulty of the human body to dump heat via evaporative cooling. On the other hand, you’ve found that a dehumidifier allows you to lower the heat while still feeling comfortable while I’ve found the opposite. So although your solution works for you, the thermal conductivity of moist air probably isn’t the explanation. Thanks for commenting! You’re right! Jordan my experiment with floor temperature and stratification was not made in a lab! There could be different variable that gave me to think as I did. But what I’m sure is that sitting in the basement at the same temperature with 67% of humidity, ”we felt” a lot cooler than at 50%. My wife is working at a desk in the basement and before that we used an dehumidifier, she was using a small infrared heater to feel warmer. She don’t need it anymore. I live in a city north of Montreal QC. Canada. Weather in Montreal is often very humid. In my work I was obligated to travel. I do remember that at one moment in time I was in Abitibi region in winter and I had do stay there several days. I recall a morning that it was -49C in Amos QC. When I sat in my car, the foam of the seat was like a brick Lol ! But i did not feel as cold as some days in Montréal with warmer temperature. It’s our perceived feeling of the temperature that count. We put our thermostat at 68F degrees, if we were heating at a higher temperature we would feel warmer as the humidity increase. Maybe you’re heating at a higher degree than us or possibly our perceived feeling is different. Thanks again to have taken the time to reply! I googled my way into this article to find the average humidity of a Vancouver home, and soon found myself engrossed in the dialog this article generated. Thanks. I love this thread Rob and your great explanation of your deep seated understanding of thermodynamics and enthalpy of vaporization. Electric resistance heating is a very poor way to go in many and perhaps most circumstances. My comments below refer to the better alternative of using heat pumps. Where you are Rob, with winter temperatures around or above zero deg C an air to air heat pump gets a decent cop of 4 or so. It’s obviously cheaper to heat with that compared to the dehumidifier (cop of 1.5). However you still need the dehumidifier to get your humidity levels down. So even in your circumstance the dehumidifier is still primarily a remedial device not an efficient heating device (although better than resistance heating). Just that many of us may not have realized the side benefit of the heat of condensation from it. Re drying clothes inside (which we do in winter to humidify our house — outside in the sun in summer) Where did the heat come from to vaporize the water from the clothes? In other words drying clothes insides makes the room air cooler. Then that same heat is put back into the air when it condenses in the dehumidifier. So there is no net benefit energy wise (cheaper to let a heat pump provide the energy to vaporize in the first place) unless you have to do it anyway to get the humidity down. I agree 100%. If heating is the goal, a heat pump is a much more effective solution than a dehumidifier. Though there is much more significant capital cost to consider. Re drying clothes, I think your point (and I agree) is that if you heat your home with a heat pump that has a COP greater than that of your dehumidifier, then you are better off simply allowing water vapour to exit the home without recondensing it, since it will be cheaper to replace the heat loss using the heat pump than it will be to prevent the heat loss using the dehumidifier. One interesting thing about the air to air heat pumps is that they benefit from the heat of condensation of the water in the outside air — energy that the sun provided to put the moisture in the air in the first place and for free! Under these conditions the heat pump is constantly dripping water. If you measured the weight of this water per hour and multiplied by the heat of vaporization for that unit of weight, you would see how much of a freebee you are getting. This is a real bonus in a place where for many months of the year temps are not too low and humidity is high. This helps to keep the COP figures of these pumps high. Once frost starts to form on the outside unit you initially get the benefit of both the heat of condensation as well as the heat of fusion (ice). However since there is no way to slough the ice off, the air flow becomes blocked and the unit has to periodically go into defrost mode losing the advantage of the heat of fusion but not all the heat of condensation. Still a bonus in high humidity areas with the newer pumps with smart defrost cycles! So to some extent you are heating with a dehumidifier it’s just that its called a heat pump!! What caused the vapour to turn into liquid water? A cold coil running coolant. How did the coil get cold? A motor running a small fridge. The vapour off-loads energy to the coolant, HEATING THE COOLANT. The exact amount of (your termed ‘free’ energy) the vapour just gave up to the coolant now needs to be removed from the coolant to maintain the same ‘cold’ temp of the coil. This comes from the motor doing more work that you pay for in your energy bill. At best a dehumidifier is 100% efficient. I don’t disagree with your analysis but I do disagree with your conclusion. Imagine running a dehumidifier in an enclosed air tight box inside your home. That process would be exactly 100% efficient at heating your home. The heat released from the box (by radiation, convection, and conduction) would exactly equal the electrical energy you put into the box. It would be exactly the same result as if you had an electric heater in the box instead of a dehumidifier. Now open the box. Yes, you will “consume” more electricity as the motor needs to work harder to condense water vapour in the air. But all of the electricity you are “consuming” is still converted to heat in your home, and in addition you capture the heat from the condensation of the water (which is “free” to the extent that your home is more humid than you’d like). Are you sure about your calculations regarding the heat output of the dehumidifier? If your machine is of a desiccant type, using a wheel of geolite or something and a heater element, then I agree with what you stated, but if it is a standard compressor type, then I believe you missed the part where it creates ice, thus cooling your room and all, as well as heating it up as part of the carnot cycle. Actually, take it a few degrees lower, say 10 Celsius, and I guess it would not work at all. Unless there is a permanent accumulation of ice, its formation is irrelevant. Yes the water freezes, but it also melts and those two processes exactly cancel each other in terms of heat transfer to/from the surroundings. To determine the net energy transfer you only need to know the energy of the original state (water vapour at a certain temperature) and the energy of the final state (liquid water at a certain temperature). Intermediate states don’t matter. Incidentally, if there was a permanent accumulation of ice, that would be even better, assuming you had some way of removing the ice from your home periodically. Then you would get both the enthalpy of fusion and the enthalpy of vaporization released into your home. Aside: I’ve often thought of doing a similar experiment to see what the COP of a small chest freezer would be if used as a room heater. Simply freeze buckets of water and then move them outside to melt. A fairly labor intensive way of heating a home but it would, by definition, have a COP greater than 1. I’m just not sure how much greater. You have an article that’s about 90% true, but saying a dehumidifier releases more heat into your home that it consumes is deceptive. In addition to the electrical energy it consumes, it is converting latent heat into sensible heat by condensing water, however the latent heat was already inside your home to begin with. Yes, that conversion will increase the air temperature since dry air has a lower specific heat than humid air (and thus the same amount of heat will equate to a higher temperature), but the net heat input into a closed system (your house) is exactly equal to the electrical consumption of the dehumidifier, not a kJ more. Therefore, the claim that your dehumidifier will save you $75 a year over an electric heater is misleading because the extra 250W is not a net input into your home (it’s heat that’s already there). I think you are confused because you are thinking it is exactly the same as a residential heat pump. However, the difference is that a heat pump moves heat from outside to inside (net input), whereas the dehumidifier moves around heat that is already in your house (net zero heat change after subtracting electrical consumption). Therefore, a 480W dehumidifier is exactly equal to a 480W electric heater in terms of cost to heat your home. Now I will admit the above is only true if you have zero air infiltration into your house. But all houses leak to some extent, so you will have latent heat entering your home in the form of humid air. However, for every cubic meter of cold humid air that enters your house, you get an equal volume of heated dry air leaving. So the real efficiency of your setup would be related to the difference in energy between the air entering and leaving your house. If I make a few assumptions about your conditions (4ºC 100%RH outside air, 16ºC 20%RH inside air) and do some basic psychometric calculations, you would have a net loss of about -5.4 kJ/m^3 of air exchanged. But if the outside temp is above 6.5ºC @100% you will start to get a net gain. At 10ºC @100%, you would have a net gain of +9.8 kJ/m^3. So there is some basis to having a net heat gain from dehumidifying air entering your house, but there are a lot of variables including temperature and humidity differences, infiltration rate, dehumidification capacity, etc. Most of the time this isn’t going to economical, but where you live might be an exception if the conditions are right. Sealing up air leaks and running a heat pump will probably be far more efficient though. Hopefully that explains what’s really going on. Again dehumidifying the air in your home isn’t an infinite source of free heat like you make it sound, there are other factors at work here. I’m pretty sure I am not confused. Any water I condense, whether the water vapour came from air infiltration or from internal sources (breathing, cooking, showering, etc), represents latent heat energy that would have otherwise been lost if the water was allowed to exit my home in vapour form. Condensing water that would otherwise exit the home as a vapour will always be a net energy gain. Whether the latent heat energy was already in the home or not is irrelevant. In the case of condensing water vapour due to air infiltration, we seem to be in agreement that I am capturing latent heat energy that came from outside the home. In the case of condensing water vapour generated by internal sources I agree I am capturing latent heat energy that was already in the home. Where you seem to disagree, I think, is when I argue that without my capturing it, the energy would have been lost (ie the water would be expelled from the home as vapour instead of liquid). Your argument seems to suggest you believe that the latent heat of water vapour generated within a home will stay within the home. But that can’t be true. I know it can’t be true because I keep generating water vapour (breathing, showering, cooking, etc) and yet I don’t see any puddles forming in my home (or even fog on my windows). This can only mean that the water vapour I’m generating exits my home in vapour form (unless of course I condense it in a dehumidifier). I agree the energy “lost” by generating water vapour inside my home is exactly equal to the energy “gained” from condensing it. But that doesn’t make it a net 0 benefit since I incur the “loss” whether I condense the vapour or not. Caveat: If your cost of electricity per kWh is over 1.5 times more than whatever method you use to heat your home, then you are better off allowing water vapour to exit the home without recondensing it as it will be cheaper to replace the heat loss than to prevent the heat loss using a dehumidifier with COP of 1.5. Could I trouble you for your opinion on drying clothes with a dehumidifier? I plan on building an 85 cuft closet (relatively air tight) 1″ expanded foam walls with a 4′ dia 25 cuft drum that rotates 30x /hr. The dehumidifier I believe is ~600w. I’m just assuming I can dry clothes at a greater efficiency than my electric tumble dryer. Do you think this is wort the effort to build? I have fun building things, and I know it’s a plus just keeping the kw’s in my house, but I would love your estimation of savings. While I think that would work, I don’t see much advantage over simply hanging the wet clothing on an indoor rack in the same room as the dehumidifier. That’s what I do in the winter. If you prefer a tumbled feel to the clothing you could vent the hot, humid air from a conventional dryer indoors while running the dehumidifier to condense the water vapour. If you’re heating your home with electricity, then in theory those two methods and your proposed method would all be equally efficient since no hot air or water vapour are vented from the home. In terms of estimated savings compared to operating a conventional dryer, I’m not certain, but I would guess that practically all of the energy put into a conventional dryer goes into the exhaust in the form of hot air and water vapor. A typical dryer may consumes about 5kWh of electricity (about $0.50 worth where I live) per load. If you dry your clothing by a method that uses that energy to heat your home in addition to drying your clothes, then you’re effectively saving $0.50 per load. Actually, since the power company’s measurement of electricity usage in a two-phase system, such as is used in 120V/240V residential unit, depends upon the current, (amps,) in the leg, (phase,) that draws the most current, the use of 220V appliances as compared to 120V appliances ends up being cheaper by half. Thus, a 120V, 750W heater drawing 6.25 Amps uses exactly the same amount of energy as a 240V, 750W heater drawing 3.125 Amps, but the electrical utility will charge you twice as much. This is why we electricians attempt to balance the load of your home when we assign circuits to a particular breaker in your panel. If A phase and B phase draw the same amount of current, you will pay the lowest price for your electricity. If one leg draws more, such as in the case of adding a single phase, (120V,) high energy requirement appliance such as a window unit air conditioner, the house meter will read only the phase that is drawing the most current and double it to calculate the amount of electricity you used. For this reason, in every case except for incidental or intermittent loads, (less than 1 amp,) the use of 220V appliances is preferred. They are not ‘more efficient,’ but they cost less to operate due to how the meter on your house works. Do not attempt to balance your power panel yourself. Not only is it dangerous, but you could end up with higher bills due to the effect of intermittent loading. (An example of this would be to place all of your kitchen outlets on the same phase, then operating the toaster oven and the microwave oven simultaneously.) As always, an insured professional licensed in your region should make any alterations of your home’s electrical systems. I’ve never heard that before. I’m not sure if you will check back here again, but if you do, I’d be grateful if you can point to some evidence for that claim. It’s not consistent with my own experience taking apart both analog and digital kWh meters (and just reconfirmed by a google image search). I see that current is sensed as the magnetic field strength in an inductor through which BOTH line A and line B pass in parallel. In this configuration, the current measured will be the sum of the currents in line A and line B rather than the maximum as you have suggested. Based on this, I believe power meters are designed to accurately record the true total kWh consumed, regardless of whether the loads are balanced on the two lines. Because A and B legs are 120 degrees out of phase relative to one another, their respective magnetic fields peak at different times, and thus their magnetic fields are not additive. There is a formula to determine this average intensity, but it requires each leg to be separately monitored to use it. Instead, the inductive coil reads only the peak intensity of the magnetic fields induced by current flow in the line conductors as opposed to the average. There is a reason commercial electrical installations pass each phase through separate induction coils, and a reason they don’t allow you to simply pass all three phases through a single coil as in the low-power home meter. If legs A and B were 120 degrees out of phase I agree my argument would make no sense. But I’m certain that in single-phase residential wiring, legs A and B are 180 degrees out of phase (that’s how you can get 240V RMS between them but 120V RMS between either one and neutral… if they were 120 degrees out of phase you could not do that). In the electrical meter I took apart, I observed that leg A and B were wired in parallel (side by side) through a single sensing inductor, but one leg was reversed (ie the two lines entered the inductor from opposite sides). Because they are 180 degrees out of phase, and one line is reversed, the two currents through the inductor will be in phase and their magnetic fields will be additive. This is a bit of a clever “trick” so the meter doesn’t need to monitor the two legs independently, but still accurately measures the true sum of the two currents. Thus I stand by my original assertion that a residential electrical meter does accurately record the true total kWh consumed, regardless of whether the loads are balanced on the two legs. In commercial 3 phase wiring which you referred to, the same trick can’t be used because you have 3 legs that are 120 degrees out of phase. There is no way to put those 3 legs through a single inductor in such a way that the currents will be in phase and the magnetic fields will add. Therefore you need to measure each leg independently (3 inductors) and sum them by some other means. That’s just it: I don’t think the magnetic fields add. I think the induction coil is only reading peak current, not average current, in which case, only the high leg is registering, no matter how many legs pass through the coil. in the 1980’s, not long after I got out of the Navy, my mother was complaining about her nearly $300/mo electricity bill in the summer. (We live in New Orleans, which is as wet, but not as cold, as the Northwest.) My boss at the time was an old-school electrician who knew tricks I still haven’t figured out, and I discussed the problem with him. The result was an electric bill dropping from almost $300/month in the peak heat of August to under $100. Since then I have been very diligent in balancing the load on any power panel that I install or service. All that aside, I came to this site to learn how dehumidifiers work, and to determine if that is what I want for a special project I have in mind. Having discovered your article, and having similar attitudes toward running the heater, I think a dehumidifier may well be the answer to my home comfort issues. I plan to try it myself, not with the aim of making my house warm, but with the goal of bumping up the bottom of the chill at night and keeping my stuff mold-free in the damp winter and spring, when sunshine has to be shipped in from Arizona. The magnetic fields add due to the principal of superposition https://en.wikipedia.org/wiki/Superposition_principle which applies to many physical phenomena including electric and magnetic fields. As an aside, this same principle is used in GFI devices. In that case the hot wire and neutral wire pass in parallel through a single inductor core. Because the current in the two wires flows in opposite directions the corresponding magnetic fields add to 0 as long as the two currents are equal. If the two currents are not equal, a magnetic field is detected (which means some current is leaking to ground) and the GFI trips. I can’t comment on what may have happened at your mother’s house. It’s possible that residential power meters were different in the 80s, but I believe even analog meters have operated on the same principle for a long time. There are probably other good reasons to balance the loads at the panel (for example it reduces the likelihood of the homeowner exceeding the current capacity of either leg) but I don’t think there is a financial benefit. Good luck with your dehumidifier project. Rob, how much energy would be needed to condense 1000 m3 of water with RH of 65% at 35 deg celcius. Trying to build an air water machine for the wilderness in Africa. Can u help? I live in Minnesota and recently insulated my garage. The single stall is well insulated and I just use a small electric blower to keep it warm. I realized with a heated garage snow and ice melts off the car constantly. The garage gets very humid and would undoubtedly become a problem if ignored. After installing a dehumidifier the electric heater runs less and the garage stays warmer. Ice no longer forms on the window. A google search produces tons of examples of people with humidity problems in cold climate garages. Most forums suggest bringing in fresh air and paying for the heat loss. Why doesn’t anyone talk about the heat advantage of dehumidifiers? I find this forum fascinating in that from a building science point of view, not all parameters are been considered. I attended a council flat in UK which felt permanently cold, winter and summer. As the brick construction consisted of cavity wall insulation, it was suggested that the the inner walls were wet because of the insulation barrier, compromising any vapour migration from indoors to outdoors as it is colder. Also the walls had reduced insulation because they were soaking wet. The flat had one air brick in the kitchen and the occupant opened the bathroom window when at home, but sealed everything when he went out. Also the sealed double glazing was airtight. The visiting maintenance surveyor had no advice to give, so I suggested a 100W dehumidifier costing £110. Within about three days, he was comfortable. It is well known that one’s comfort level improves when humidity is lowered and when temperature is not changed. As many people in the UK have difficulty paying the costly fuel tariff, switching off the heat altogether and using a dehumidifier is an excellent option. it is better to be dry and cold rather than damp at a higher temperature. We run them in the ‘rainy’ season (October to March) and only supplement with baseboards when the indoor temp falls below 60, and to warm up the bathroom for showers. Since it is not so damp (keep it set at 60) we feel more comfortable, but still need a sweater and slippers. I reuse the collected water in the wash-machine and I do dry my wash indoors, only using the dryer to fluff. Thanks for the great read, and comments too. Interesting Thread I’d never considered the Enthlapy side of the effeciency for a dehumidifier, great work, however for completeness you’ll probably need to include something that Electrical engineers call “Phase Angle” or “power Factor” which is the angle difference between the Current peak and the Voltage peak for power waveform. For a load that’s a pure resistor the current is in phase with the voltage however for a load that’s Inductive, like an electric motor (compressor and fan) the current peak lags the voltage peak. This is important in any “work” calculations beacue work is a Real quanity the Imaginary component of the current does not do Real work meaning you need to be very careful when calculating energy consumption for any product with an Inductive load, maybe your measurement tool took phase angle into account and maybe it didnt. Even experienced EE’s make mistakes with these calculations especially when you start calculating something like Effeciency. To do the Cost calculation properly you also need to understand if you’re paying for just Real I *V or (Real I + Imaginary I) *V older meters only calculated Real power In many countries newer electricity meters calculate Real + Imaginary I because the power companies don’t actually like providing Imaginary I because they need to correct for it. Great comments, Nancy and Robert. It just goes to show that in order to make the best of our individual situations, it is important to work out exactly what is going on in the first place. Not all building construction is the same, nor are they built to exacting building regulations, at least in UK they are not. Furthermore quite often government policy advises on short-term solutions to achieve energy savings to maintain voter confidence rather than give sound practical advice. Most houses here have sealed windows, gas-fired heating and extractor fans for kitchen and bathroom. In addition older houses, representing much of our housing stock, are retrofitted with extra insulation, much of it low grade and retaining moisture. Unless a close check is made on the build-up of moisture, the fabric of many outer walls has increased conductance resulting in heat loss. Now because an extract fan runs typically for short spells only and the flap to the outside closes, air flow within the building is halted and moisture is trapped. In this situation, your solution using a dehumidifier Nancy, is just about right. I do however have one point to add. In drier weather, ie spring, summer and autumn, it would be far better to improve airflow by passive, non mechanical, means. Traditionally, the stack effect of the open fire and chimney served this purpose. Now that that many fireplaces are blocked up, it is important to utilise airbricks to best advantage for venting. My approach is to find out whether there is a trickle airflow when all windows are shut. Robert. Thanks for highlighting phase angle. Here in UK, we are being pressurised into having Smart meters to replace old-style ones and some of our bills are working out different, usually higher than previously. This implies that we are now being differently. How can we check that we are receiving good value? Are the power companies audited? Water condensing and evaporating on windows is a major source of heat loss. The heat energy effectivly gets transferred outside. I wonder if your calculations are conservative given the extra heat loss through windows with higher humidity. Note that baseboard heaters are usually placed under Windows. – hence evaporating and condensing. Now that dehumidifiers are available in small and compact versions, I would love to see a bathroom vanity undermount built-in Dehumidifier. So far they are just standalone or large size units. If they were avaliable, then I would put it in the rental suite bathroom. (Keeps the bathroom warm, saves energy and prevents mould and bad smells) Having built in would save the chore of emptying the water (pipe it into the sink) plus it would be less likely to get damaged, moved or stolen. Might be some time yet before someone tries to invent/market it. Most people aren’t aware of the physics and comfort advantage of using it in cold /humid environments. I know the hydro company doesn’t promote them for electricity savings because they are an extra lagging power factor load… maybe that’s why hardly anyone touts the benifits of them besides folks like us. Didn’t read the comments but you could dehumidify outside air into the house through a heat exchanger. Warming the humid incoming air and recovering heat from the dry air being expelled. Warm humid air would then be condensed raising the temperature further. Basically a diy heat pump for your specific conditions. Great article. I just bought a dehumidifier for allergy concerns, and was thinking that my electric bill would be going up about $30 a month. Then I started thinking about the heat produced by the equipment and looked to verify that would in fact reduce the heat load during the Winter months. It’s now mid-October in the Pacific Northwest and I’ve yet to turn on my heat. It’s been old enough outside that I’ve been expecting to have to do so, but apparently getting about 500-600 watts of heat running 24/7 is enough to delay the start of heating season. Now the concern is spring and summer. Hopefully AC alone will be enough to dehumidify our house, and if so, that will sort of make the AC free since it will be done for a medical reason, not a comfort reason. Interesting read. I’ve been using a humidifier to combat the dry baseboard heat in our apartment. Although it does get pretty cold where we are (Montreal) I think one of the solutions might be to just go to a lower temp. I’m fine at 18 but I think 16 would be manageable while also trying out a de-humidifier. I was crazy enough to put up a misting roof system in the summer with conventional plastic PVC, a misting timer and set it up on the roof and lower the conductive heating of the roof membrane that throughout the course of a day radiates to inside the house. I use to be a weather forecaster for the USAF and today, I go to college to become a middle grade science teacher. Water can either be your friend or your enemy depending on what the weather is outside with a little knowledge on how to use it or remove it for your benefit. Here in Alabama, Alabama Power only offers two residential rates and they make you really think about whether you want to attempt time shifting your power usage because of how they manipulate the rates and when they do it. Time shifting saves me just over 3 cents per kilowatt hour and I use more power heating my home than cooling it. I can tolerate in the summer it being 85 degrees inside my home if I keep the humidity down and air moving. I’m like this guy, it’s all in the mathematics; if one large capacity dehumidifier can by itself keep my home comfortable without having to run AC; I’m all for it, but should the temperature start pushing 90 inside, then there’s no benefit to running it if I need my window AC units to run and they too can dehumidify the air wherever I run them. In the winter time, I too keep my home on the cooler than most, 58 to 60 degrees and dress appropriate to it and run a heated mattress pad at night. Again, on super cold and very low humidity days outside, I turn to my favorite trick and that is to hang my clothes up inside and use a fan to dry them or with tile floors, give them a good once over with a wet mop. Learning how to manipulate water in the air really makes a difference. Yes, dehumidifiers produce heat, just like AC units do but that warmer air is vented outside. It’s a neat trick to run one in the winter time that doubles as a heater on a low and/or mid power level, but it’s one machine. I have AC units in every room of my house; no one uses the same number of dehumidifiers unless one you have the money to run them and two, you use every room in your house, which I do not. A dryer home is easier to cool down or heat up, but humidity isn’t always your enemy, it too stores heat especially in places where the cold is too a desert in your home when raised from dew points outside that are sub zero to 55 or 60 degrees in my case or 70 to 75 for those of you who don’t paying for your homes to be that warm. Understanding water vapor is a big deal in both seasons! Thanks for the article! I have a dehumidifier (a very large one) that I use in my very large basement. It does NOT work to heat the basement, however, and a trip to the basement is a challenge to say the least! The dehumidifier works very well to keep the basement dry, but NOT to heat it. I noticed that you start your article talking about the 16-degree temp in your own home so I’m assuming this article is a spoof! No, not a spoof… it’s 16 degrees Celsius, that’s about 60 degrees Fahrenheit. Maybe someone here knows the answer? So many thanks for the info and the inspiration! question on heating a room with a dehumidifier, would it not be more efficient to duct the cold air off the evaporator outside rather than using the heat from the compressor and fan to warm it up before dumping it back into the room. Have I got ithis right? I have a further question not covered in past posts. We often leave our flat vacant for months at a time in winter leaving the heating set to run at a lowish temperature for a few hours each day. Should we purchase a draining pipe for the dehumidifier and leave that running as well? Yes, but only if the cold air from the evaporator is colder than the outside air. Keep in mind any air you blow outside will be replaced by air drawn into the house somewhere else. You’ve got almost everything right (assuming you would otherwise be heating your flat with electric heaters). The one thing I’m not certain of is whether a less humid room will “feel” warmer. Some claim drier air means drier clothing, increasing insulative value and making you feel warmer. Others claim the drier air increases your sweat evaporation rate and makes you feel cooler. I don’t know for certain which is the greater effect. I haven’t noticed a significant difference either way. Yes, you can use a drain tube to the outside. It will actually improve the heating performance a bit since the cold water is dumped directly outside rather than warming it back up to the room temperature. This claim is true but only as long as the clothing articles are not fully wet. While humid fibers might increase the heat loss from conduction, that avenue of heat loss is negligible. Indeed, fibers that have absorbed some water are probably thicker and would reduce heat losses from convection and vapor transfer so it’s likely a wash. In either case, the near skin environment is far more humid than the home environment so there’s likely little difference in fiber humidity. For home comfort, this is a non-issue. Body evaporation, on the other hand, is one of the major avenues of heat dissipation and will occur as long as ambient is below body temperature. Heat indices show this is a very strong effect. According to the heat index, a 75F ambient with 5% humidity feels like 69F whereas 75F with 90% RH feels like 79F. Can you please tell me whether the dehumidifier you have is a desiccant or refrigerant? We live by a small river in France & although we have no signs of damp there will be/is clearly moisture in the air. We use electric rad’s, but only a little to keep bills down & so, like you, have a rather cool house. We also use an old inefficient wood burner to help the heat & have an open fire in the living room that gets used in the evenings. Sorry, forgot to add to last comment that outside temp can be freezing or below in Jan/Feb. Use of a dehumidifier for controlling excess indoor water vapor (high RH), plus the heating benefit, is applicable in many parts of the world, and especially in dwellings with living space underground (aka basements). We live in Southern IN, USA and have a bi-level (split foyer) home. Typical cinder block lower level foundation on a concrete slab. We have an exterior french drain system piped to indoor sump pump well and then pumped to street, and so have high native relative humidity (RH) in the lower level. High RH is also due to water vapor moving from wet outdoor soil through cinder blocks, motar cracks, and from below the slab upwards. In other words, construction/design wasn’t/isn’t perfect and water vapor moves inward, especially with 45-60 inches of rain per year. I haven’t gotten around to sealing/insulating all the basement walls behind the (original) drywall yet. We’ve been using a dehumidifer for several years, and after reading your post, I decided to do some measurments of my own. Model is Danby Premiere DDR45A2GP Energy Star Rated unit. It holds 11 pints of water when tank is full. It consumes anywhere from 6.38 kWh to 7.2 kWh per tank using low fan speed, depending on temperature and vapor pressure/RH downstairs. COP averaged 1.48 during tests over 4 days at 65F (18C) basement temperature. Cycle time varied from 20.33 hours to 21 hours per full tank. Total heat energy produced by unit (including condensation of water vapor) averaged 0.469 kWh or 1,600 btu/h. For reference, our air source heat pump produces app. 24,000 btu/h max. heating with a season average COP (HSPF) of 2.5. Air handler is set to low speed continuous ‘on’ (app. 30 watts) during heating season to equalize temperatures up and down stairs and to clean air through filtering media. When we upgrade our old heat pump, I may invest in a higher efficiency dehumidifer that is integrated into the air handler. COP and capacity is much greater than portable units. I am amazed at such a large response and have been unable to read all the comments. I live on the other side of the world in New Zealand, “on the edge of the world”, and have a lot of rain and temperatures rarely fall below freezing. The heat pumps will operate somewhat below freezing but understand their efficiency is such they have an efficiency of 1 kW input minimum for 5 kW output. Where I disagree with you is in the use of the dryer into the utility room via a condenser so very little heat is lost and the dryer is very efficient. Amazingly, we have no insulation in the house in the ceiling or in the walls. I don’t think it had been invented when this place was built. I am a naturalized Canadian’s and lived in Montreal for more than 14 years and never really felt cold when temperatures were 30 below zero Fahrenheit. The sun seems to shine during the winter most of the time and the car was like a mobile greenhouse. To get to the point, I have now just purchased a dehumidifier and you have confirmed my idea that I should be able to to effectively use it as a heater. We have wonderful, inexpensive. award-winning White wine in New Zealand and we import what I consider to be the best,inexpensive award-winning wine in the world from Australia where every year is a vintage year. I like to keep the house temperature down to 16° C which of course is cellar temperature and I converted my two-door fridge to a wine fridge and maintain the temperature of -7° C for the white wine. I now propose to install my heat pump in the shower room which together with 750 W infrared lights greets you when you come out of the shower. For an introvert engineer,I seem to have got verbal diarrhea.Obviously, it’s a very interesting subject. Thank you for hosting the original article and the great comments everyone. For me the key question is a little different – if a dehumidifier is used in a home that is heated, say by a central gas furnace, will the efficiency of the gas consumption go up – and cost less overall or run a hotter house? Why could that be? As pointed out will that feel warmer? Mary’s post seems to support the proposition (November 27, 2009 at 1:55 pm) that it will. In terms of overall cost, before doing any calculations, the energy consumption of a dehumidifier is magnitudes less than the raw heating energy put into a house. On this basis it seems likely that a dehumidifier and heater in a relatively humid house will be more energy and cost efficient together than the heater alone. I look forward to any comments on this. This savings on heat costs works, but some dehumidifiers give out more heat than others. The Aeonair RD860EAW I own puts out 80 – 87 degrees of heat. This a big output, more than the results needed to break even. Now I am looking for another one for the winter. Unfortunately, I have found that many other models put out less heat. Any idea how to choose the right one?